24, of Export, Pennsylvania, died Dec. 3 of wounds suffered in a Nov. 27 improvised explosive device attack in Ghazni province, Afghanistan. Capt. Andrew Patrick Ross, Sgt. 1st Class Eric Michael Emond and Staff Sgt. Dylan Elchin were also killed in the same incident. McClary was an infantryman assigned to 1st Battalion, 38th Infantry Regiment, 1st Stryker Brigade Combat Team, 4th Infantry Division, at Fort Carson, Colorado. The Pentagon has identified a fourth casualty from the improvised explosive device that claimed the lives of three special operations troops last week and left three other Americans wounded. Sgt. 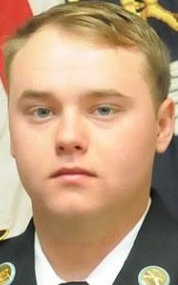 Jason Mitchell McClary died Sunday in Landstuhl, Germany, as a result of injuries sustained from the IED blast that occurred Tuesday in Andar district, Ghazni province, Afghanistan. The incident is under investigation, according to NATO’s Resolute Support mission to train and advise Afghan forces. McClary, 24, was from Export, Pennsylvania. He was an infantryman assigned to 1st Battalion, 38th Infantry Regiment, 1st Stryker Brigade Combat Team, 4th Infantry Division, out of Fort Carson, Colorado. McClary had been in Afghanistan since April. Prior to that, he served in Iraq from May 2016 to January 2017. He had received two Purple Hearts, three Army Commendation Medals, one of which was with Valor, an Army Good Conduct Medal, the Afghanistan Campaign Medal, the Iraq Campaign Medal, the Combat Infantry Badge and the Air Assault Badge. McClary joined the Army in January 2014, and had been assigned at Fort Carson since October 2017. Three special operations troops — two Army Green Berets and an Air Force combat controller — were immediately killed when the IED that killed McClary detonated last week. Four wounded Americans, including three U.S. service members and a civilian contractor, were initially wounded by the detonation. The wounded were immediately evacuated, following the blast. Resolute Support did not immediately provide a status update on the other three Americans who were wounded. The IED was reportedly very large. The Taliban’s official spokesman, Zabihullah Mujahid, claimed the detonation completely destroyed a U.S. tank, likely referencing an up-armored Oskosh M-ATV or Mine-Resistant Ambush Protected vehicle that the troops would have been riding in. The blast occurred on the outskirts of Ghazni City, the Taliban said. McClary’s death raised the total count of U.S. troops killed in action this year to 14. November was the bloodiest month of the year, accounting for five total deaths. An Army Ranger, Sgt. Leandro Jasso, died of wounds inflicted by small arms fire in western Afghanistan’s Nimroz Province on Nov. 24. Jasso’s death was likely the result of accidental friendly fire from the Afghan commandos he was accompanying during an assault on al-Qaida positions, Resolute Support said after a preliminary investigation. Earlier in the month, on Nov. 3, Maj. Brent Taylor, 39, was killed in an insider attack in Kabul. Taylor was a member of the Utah Army National Guard and also served as the mayor of North Ogden, Utah.